Amethyst naturally changes to Citrine with the changing of the earth's temperature. It is rare to find pieces that are partially changed. When it is found, it's called AMETRINE. Ametrine = Amethyst + Citrine. Each bead measures approximately 28-31mm long by 16-20mm wide by 9-13mm thick. 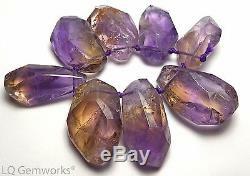 The item "XL 7 pcs AMETRINE Amethyst Citrine 28-31mm Faceted Nugget Beads NATURAL RARE /N1" is in sale since Saturday, October 22, 2016. This item is in the category "Jewelry & Watches\Loose Beads\Stone". 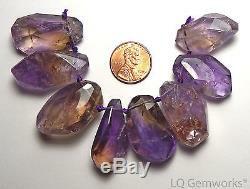 The seller is "lqgemworks" and is located in Prescott Valley, Arizona. This item can be shipped worldwide.